Whip Salon Introduces Throwdown in Bedford Square on Thursday, July 12 from 5p - 8p. 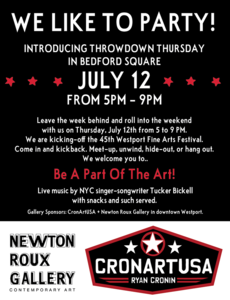 Event sponsored by local art galleries: CronArtUSA and Newton Roux Gallery in downtown Westport. Leave the week behind and roll into the weekend with us Thursday, July 12 from 5:00p to 8:00p as we kick off the 45th Westport Arts Festival! Meet-up, unwind, hide-out or hang-out. Residents and visitors flock to downtown for this weekend to experience one of the largest and most exciting local events of the summer! We welcome you to Be A Part Of The Art! Join us at the bottom of the stairs across from The Spotted Horse in Bedford Square for live music from "Tucker." Between sets you're invited to visit us at CronArtUSA (bottom of the stairs) and Newton Roux Gallery (top of the stairs) and check out some modern art paintings. CronArtUSA, founded and fueled by Artist Ryan Cronin, has expanded its operation to Westport, CT located at 31 Church Lane in Westport, CT. After twenty plus years of showing in galleries, museums, and art fairs across the country, Cronin established the original CronArtUSA flagship location in New Paltz, NY featuring his original works and prints, along with an exclusive line of merchandise ranging from apparel to home goods driven by his iconic imagery. The gallery and gift shop quickly became a community hub of social and professional activity which sparked Cronin’s decision to introduce mid-century modern furniture, which is also for sale, to create an inviting atmosphere for people to come together, build community, and absorb the art. Closed Mondays. Open Tuesday through Sunday 1:00 to 6:00 or by appointment. Newton Roux Gallery is a new contemporary art gallery in Bedford Square in downtown Westport focused on emerging realist and abstract painters. Its first solo exhibition "Seen and Not Seen" features over 25 paintings by Brooklyn artist LJ Lindhurst which will run until mid-July. The photorealistic works by Lindhurst features a highly varied array of subjects from whimsical magnified toys to vignettes of everyday life. The gallery is open daily for more information on paintings on display or set up a private viewing call 203-403-0863.